Catching up on some bird reports from over the Columbus day Weekend. Linda Gangi reports that Monday at DeKorte there were: "5 mature and 2 immature Black-crowned Night-Herons A flock of Green-winged Teals (20-30) Small flock of Golden-crowned Kinglets (I love those little birds), Yellow-rumped Warblers were all over the place, Savannah Sparrow, Black Ducks, Red-winged Blackbird, Common Yellowthroat, bunches of Lesser Yellowlegs with a few Greater Yellowlegs mixed in, Great and Snowy Egrets (not close to the numbers that have been in the last few weeks), a Kingfisher. Nigel Bates reports that on Saturday he "birded DeKorte from about 1-3 pm this afternoon. The highlight was a Vesper Sparrow along the Transco Trail, other sparrows included 2-3 Seasides, 3-4 White-crowned, Swamp, Song, and lots of Savannah. 10 species of shorebirds including 10 Pectorals, 2 dowitcher (sp? ), 1 Spotted, 6 Semipalmated Plovers, and 3 Semipalmated Sandpipers. Only warblers I saw were Palm and Yellow-rumped, although a possible Connecticut disappeared into the undergrowth before I could obtain a halfway decent look. Ray Duffy reports that on Friday afternoon, "It seemed like every step I took around the first impoundment at Mill Creek Marsh seemed to flush some sort of sparrow, Palm Warbler or goldfinch from the vegetation along the paths. Lots of the usual savannah sparrows, swamp sparrows and song sparrows. Highlight sparrows was a White-crowned. Warblers included Yellow-rumped, Prairie, Palm and Common Yellowthroat. I also had a lingering Short-billed Dowitcher. Schmidt's Woods highlights were a male black-throated blue, an Ovenbird, three Swainson's Thrushes, a Brown Creeper and a Blue-headed Vireo. Click "Continue reading …" for Ray's entire list. Next week, the NJMC is hosting two events in Ridgefield. 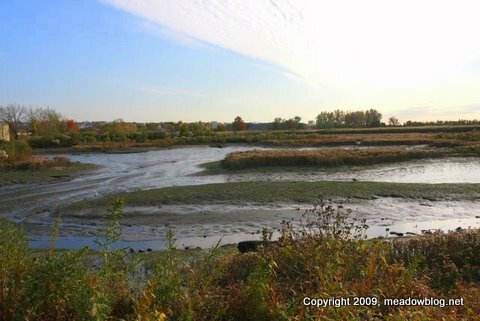 On Monday, Oct. 19, the NJMC's Jim Wright is giving a free talk and slide show, "The Meadowlands: Past, Present and Future," at 7 p.m. at the Ridgefield Public Library. 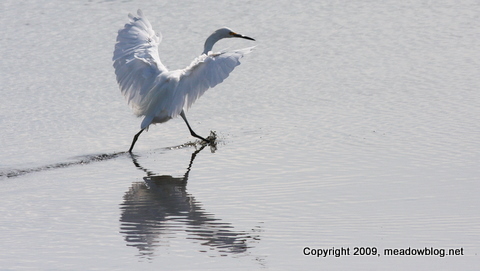 The show features great archival photographs as well as amazing nature photography – including images taken in Ridgefield. The show will run approximately one hour, including a question-and-answer session. The library is at 527 Morse Ave., Ridgefield, (201) 941-0192. Click here for directions. On Tuesday, Oct. 20, our free Third-Tuesday-of-the month Bird Walk with Bergen County Audubon Society starts at the Ridgefield Environment Center in Ridgefield and runs from 10 a.m. to noon. After a walk around the nature center, we will drive to Skeetkill Creek Marsh (above) to do some more birding. Along the way, we will stop to see how the Ridgefield Monk Parakeets are doing on Railroad Avenue. To rsvp for the walk, contact Don Torino of the BCAS at greatauk4@aol.com or 201-636-4022. Click here for earlier posts on Ridgefield, the Monk parakeets and the Nature Center. Click here for directions to the nature center. The nature center is on Shaler Boulevard just to the south of Ray Avenue. 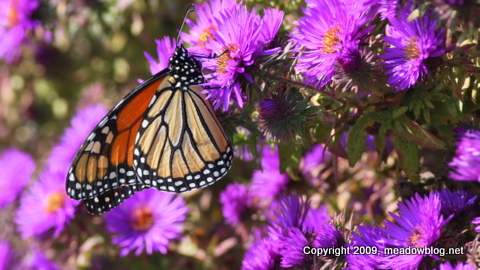 Saw the above migrating Monarch in (of all places) the DeKorte Butterfly Garden Tuesday. Also had nine Cabbage Whites and a Clouded Sulphur. Aside from the Cabbage Whites, butterfly activity has really fallen off with the cooler weather.